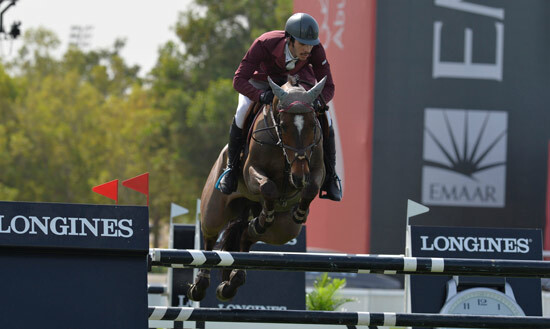 The Qatari team were in a class of their own when earning both a place at the Furusiyya FEI Nations Cup Jumping Final and a qualifying spot for the Rio 2016 Olympic Games with victory at Thursday’s second leg of the Furusiyya 2015 series in Abu Dhabi, in the United Arab Emirates. In a fascinating contest, it was last year’s winners from Ukraine who were second ahead of an impressive foursome from Egypt in third, while France slotted into fourth ahead of Saudi Arabia and Germany in equal-fifth spot. The competition was the sole Furusiyya qualifier for the Middle East, and it was the Saudi Arabian side that claimed the second of the two tickets to the series Final in Barcelona, Spain in September. Qatar also claimed the single Olympic qualifying place on offer to countries in Group F.
Coached by Jan Tops, the Qatari team was convincing from the outset, counting only single time faults from Ali Yousef Al Rumaihi (Gunder), Khalid Al Emadi (Tamira IV) and Bassem Hassan Mohammed (Palloubet D’Halong) when Sheikh Ali Bin Khalid Al Thani’s 10-year-old mare, Vienna Olympic, hit the first element at the double at four. Abdullah Al Sharbatly led Saudi Arabia into the second round with a clear from Tobalio, and when they concluded with just eight to add to their first-round scoreline, their final 25 faults would be good enough to secure that second slot at the Furusiyya Final. The third leg of the series will take place in Coapexpan, Mexico on Friday, April 24. Qatar 5 faults: Gunder (Ali Yousef Al Rumaihi) 1/4, Tamira IV (Khalid Al Emadi) 1/0, Vienna Olympic (Ali Bin Khalid Al Thani) 4/1, Palloubet D’Halong (Bassem Hassan Mohammed) 1/1. Ukraine 19 faults: Vivant (Cassio Rivetti) 4/4, Valentino Velvet (Oleksandr Onischenko) 10/6, Chadino (Ferenc Szentirmai) 5/4, Cooper (Rene Tebbel) 1/1. Egypt 21 faults: Suma’s Zorro (Sameh El Dahan) 4/0, Connaught (Mohamed Talaat) 2/6, Dakota (Abdel Kabir Said) 4/8, Amelia (Karim El Zoghby) 21/5. France 23 faults: Qlandestin Sas (Louis Bouhana) 4/12, Equador van’T Roosakker (David Frederic) 8/4, Prime Time des Vagues (Alexandre Fontanelle) 1/4, Ohm de Ponthual (Jerome Hurel) 1/9. Kingdom of Saudi Arabia 25 faults: Tobalio (Abdullah Al Sharbatly) 4/0, Valuta A (Khaled A Al Eid) 8/4, Chicago 84 (Abdul Rahman Bader Al Rahji) 16/4, Al Capone (Ramzy Al Duhami) 5/4. Germany 25 faults: Lacan 2 (Patrick Stuhlmeyer) 12/4, Horse Gym’s Balzaci (Felix Hassmann) 4/8, Nabab de Revel (Lars Nieberg) 5/4, Colorit (David Will) 0/Ret. Italy 42 faults: Admara 2 (Emanuele Gaudiano) 8/4, Cannavaro 17 (Simone Coata) 13/4, Banco Popolare Bari Cassandra (Francesco Franco) 9/4, Gitano V Berbenbroeck (Juan Carlos Garcia) 13/4. Netherlands 57 faults: Interline H (Robert Vos) 20/8, Bravour (Hendrik-Jan Schuttert) 13/17, Whitney Bv (Michael Greeve) 5/9, Avion (Willem Greve) 9/13.